Last week we toured around Pokhara with my brother from the states. With a few lucky finds, I finally felt we actually gave him the best of Pokhara. 2 years of scouting out restaurants, guest houses and entertainment have finally paid off! 1. Spacious–our room had a queen bed and a single bed, big enough for our family of 5 and there was a nook for the kids to play in. The room also had a western style closet and a couch; outside we had a table and chairs for our family as well. Tip: The bottom floor rooms are the best deal. 2. The garden equipped with tables, chairs, lounge chairs, 2 metal swings and lots of room to run, we didn’t have to leave the hotel grounds to entertain our kids! 3. Bathroom–Hot water on tap! Don’t expect hot water anywhere you go in Nepal, even if it is promised. Most guesthouses that brag about hot water usually have a solar panel on their roof–which is great but it is first come first serve when it comes to hot water. And this is the first place we have ever found that had a shower curtain between the open space for showering and the toilet. Keeping the bathroom dry is another thing we in the west take completely for granted. It is my husband’s worst pet peeve about Asia–but The Butterfly Lodge’s shower curtain sold my husband at first glance! 4. Inexpensive and for a Good Cause. $10 for a luxury room can’t be found anywhere else. And The Butterfly Lodge uses it’s proceeds to run a day care center in Lakeside called the Butterfly Foundation. Beautiful kids and a lovely way to give back to the community. Tip: Take your kids to play on their super fun playground! It’s only a small walk up the same street. Our kids visited the day care center every day to play! Our Youngest Found the Toy Stash! 1. Mike’s is the renowned breakfast favorite! Waffles! Breakfast burritos! Do I need to say more? Located by the Fish Hatchery on the waterfront, you can sit by the lake and enjoy your meal day or night. Tip: Mike’s in open EARLY! This is real bonus considering most places in Nepal don’t open til 10 am, even in the tourist area of Lakeside. They also have amazing wait staff that speak English. 2. MoonDance, across from the Palace, is our absolute family favorite. 2 items of the menu make our mouths water: the real chicken strips and the Greek salad! Although you may pennies more per meal, it is worth the quality and care in preparation and flavor! Tip: Lounge upstairs on their couches for more room for the kiddos! 3. We choose Everest Steak House for inexpensive for huge portions of meat! 4. Boomerang in the center of the strip, has a family friendly playground. We loiter there often sipping on a coke and treating ourselves to ice cream while the kids play! 1. World Peace Pagoda It has an amazing view of the mountains! Tip: Drive or walk up past the peace pagoda until you see a small wall and “parking”, from there you can easily walk over to the Peace Pagoda on the far side, sparing yourself from a thousand steps carrying your toddlers. 2. Devi Falls is great from above during the wet season, and great from below during the dry season. You can walk down steps to the internal cave of the waterfall. Tip: Skip the downstairs with the kids, it’s hot, humid and a looong walk, but enjoy the garden above! 3. Boating! Our family favorite is to hire a pontoon on Fewa Lake and happily cruise around in the peace and quiet. The big pontoons come with sun shades and are big enough for the kids to safely move and not get bored. You can also hire some one to pedal the boat for you. Tip: If the crowd is being to bug you, the middle of the lake is the best place to be away from it all! 4. Our new family favorite Bowl ing at Bhat Bhateni! 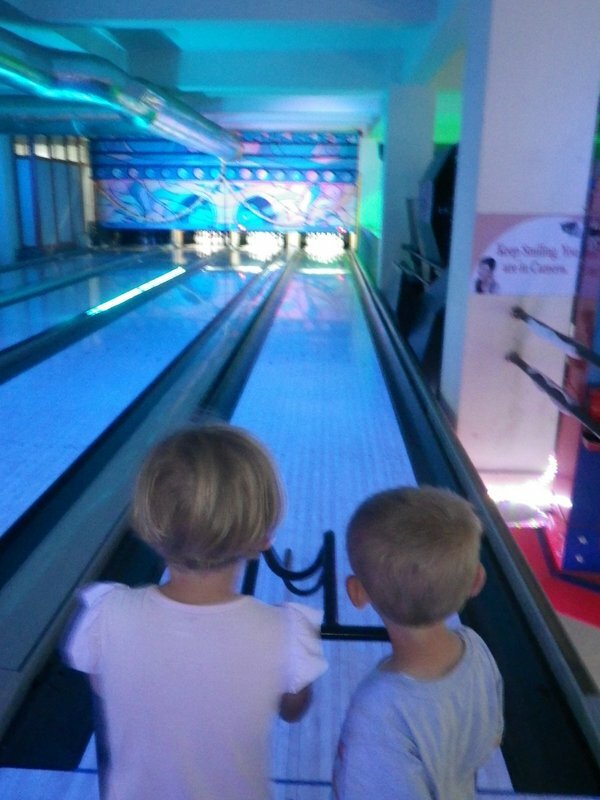 We just discovered the kid friendly bowling place and arcade at the bottom floor of Bhat Bhateni, located on New Road in Mahindra Pol. A taxi can easily take you to BB for about 300R. Filled with arcade fun, tokens cost 10R each, the kids will be able to play for hours (at least ours did!). Tip: BB is a western style grocery store, so do your shopping there too! 5. Cha Cha Wee a local fun place located behind the airport is also a great place to your kids! There is a large playground suited for ages 1-5 that only costs 30R! There is a wading pool for about 200R per person and a few carnival rides for bigger kids. There is also a restaurant. Tip: Go on a school day (Sun-Thurs) to avoid large groups of kids. 6. Last by not least is the educational and funky Mountain Museum. It is also a fun half day adventure for the whole family located behind the airport. In Nepal, kids are welcome everywhere, they can even may noise! So don’t be put off because it is a museum, it is a welcome place for the young and old alike. Entrance is 300R, kids are free. Tip: The restaurant on site is economical and has great snacks. Eat, avoid sugar crashes and keep the kids happy : ). We hope you find these tips and highlights helpful as you live, love and learn in Nepal!